Most people don’t like the idea of the arms trade. We all know that. Arms companies can only get away with fairs to trade their wares by doing it in secret. This year, we want to make sure everyone knows that. Help us out: send a letter to your local newspaper letting them know that DSEI’s happening and highlighting the arms fair exhibitors in your town. You can find your local paper’s website via the Newspaper Society list or this postcode search. We’ve even included a sample letter below, courtesy of London CAAT member Ian! You can add details of the arms companies in your area to make it even more relevant to your local paper! 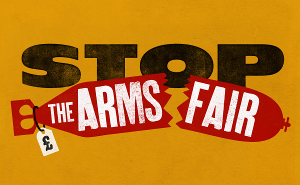 I am writing to drew attention to the DSEI arms fair taking place in east London this September. The DSEI arms fair is a bi-annual event where our government invites countries with dubious human rights records and allows them to purchase the finest new weapons money can buy. DSEI’s record of inviting countries involved in conflict or the violent repression of the people is worrying and immoral. Previous fairs have seen Libya, Bahrain, India, Pakistan, Egypt and Saudi Arabia invited and no doubt some of these countries will be there again this year. DSEI is organised by the government department UK Trade & Investment’s Defence & Security Organisation (UKTI DSO) and Clarion Events. UKTI DSO’s support is crucial to the success of DSEI and its continued existence. This year’s event takes place from 10-13 September and will feature over 1,000 arms companies from around the world, displaying arms ranging from rifles to tanks to fighter jets to battleships. Is this really something our government should be involved in? Research shows that most British people object to the UK exporting arms, except perhaps to close allies. The government persists in subsidising arms companies by about £700m a year. In a time of austerity and devastating cuts, this cannot be justified. DSEI should never darken our shores again.